In a business environment, self-assessment or self-appraisal is an important analysis that every employee of the organization need to perform. This major aim of self-evaluation is to rate one’s own accomplishments on the ground of different key factors. These factors may range from behavior, work capability, achievements and more. In a self-evaluation, a person is supposed to provide the honest opinion about self. 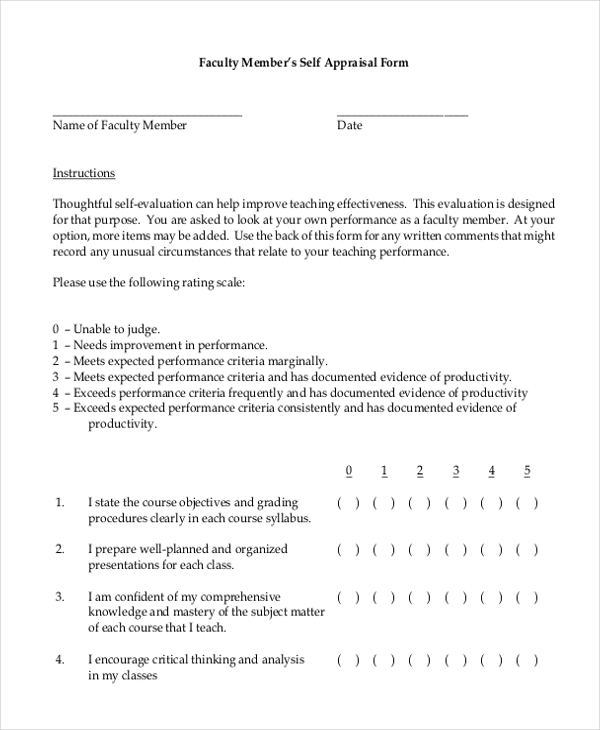 If you are an organization and want your employees to fill self-evaluation form so that corrective actions can be taken for betterment, then check out the below listed Appraisal Forms templates and let your employees do a self-assessment. 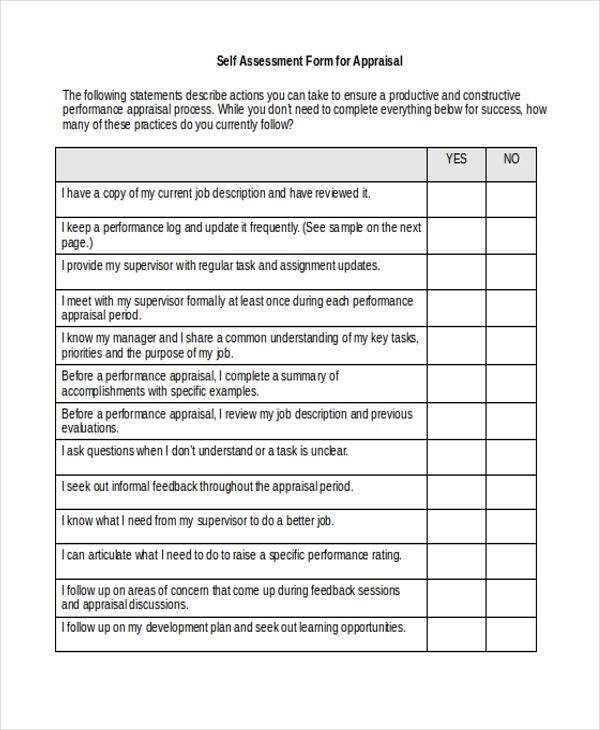 Get this sample self-appraisal form downloaded and get these filled by your employees. Even if you are an employee you can get this downloaded by yourself and get filled to evaluate your professional status. 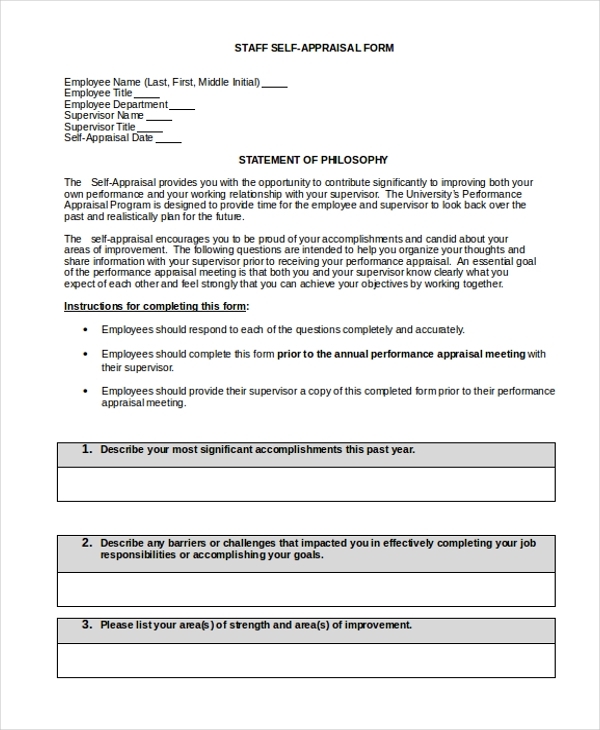 Here is another perfect self-assessment form for an appraisal that employees can utilize to evaluate their performance over the past year. This form also offers complete guidelines on how to complete a self-appraisal form. You can also see Sales Appraisal Forms. 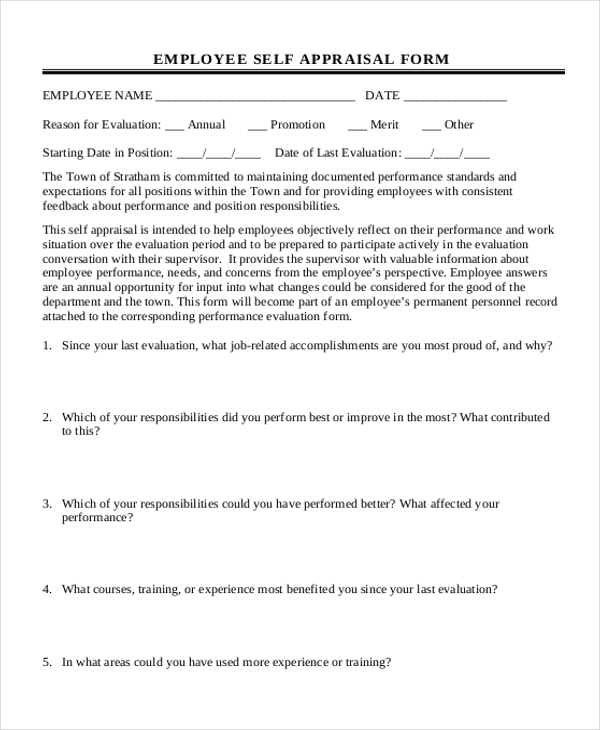 Check out this employee self-appraisal form and get it downloaded to evaluate your performance and help supervisors to assess your performance and accomplishments over the year. This file is available in word format. You can also see Self-Appraisal Examples. Are you a student looking to evaluate your own academic performance over the year? 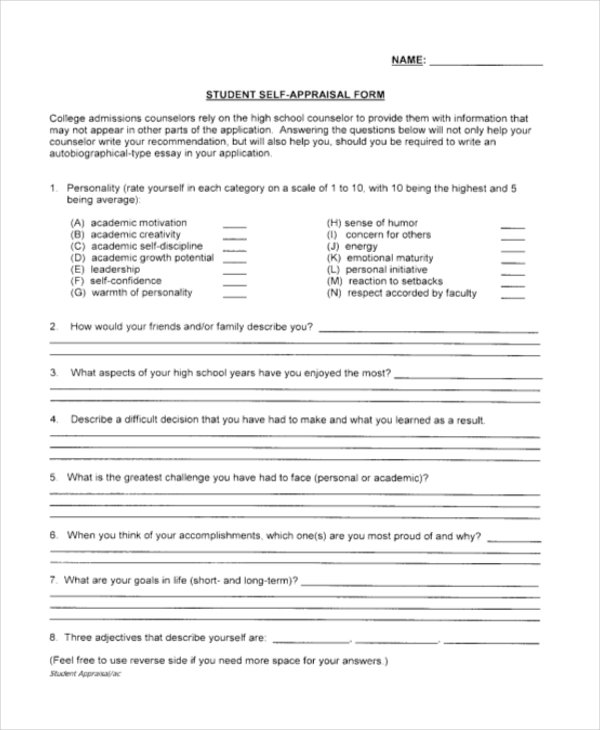 Get this student self-appraisal form downloaded online and assess what you have accomplished and acquired throughout your study period. Here is another self-evaluation report format that is ideal to be utilized by employees or anyone to check out what one has achieved in one’s career throughout a particular period. You can also customize this word format as per your preferences. Do you want to let your staff members be self-assessed so that you can understand their accomplishments and expectations effectively? 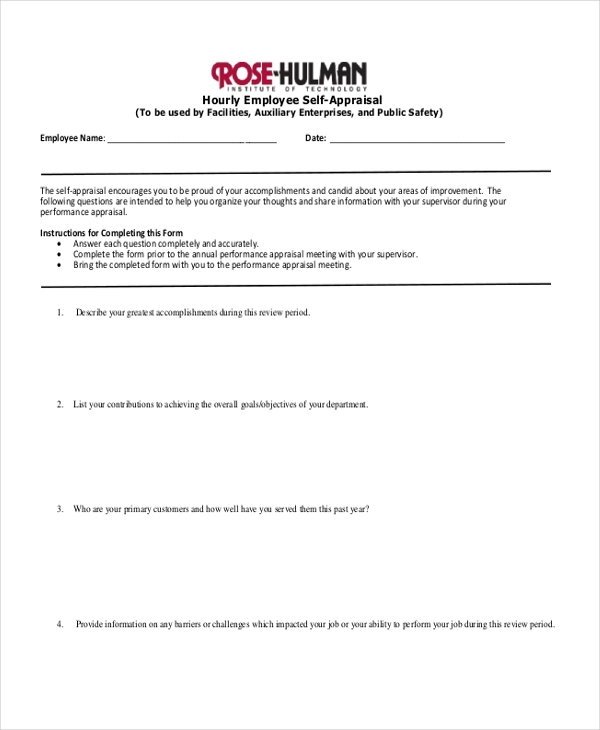 Utilize this Self-Assessment Forms and get it filled by your employees. This is available in word format. 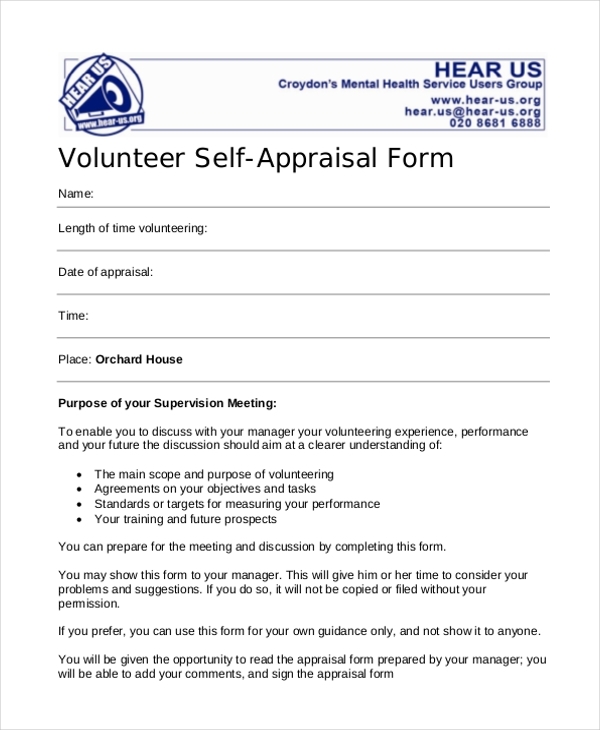 Here is another volunteer self-appraisal form that you can download instantly and get filled to self-assess your professional achievements and accomplishments throughout the whole year. Get downloaded online now. 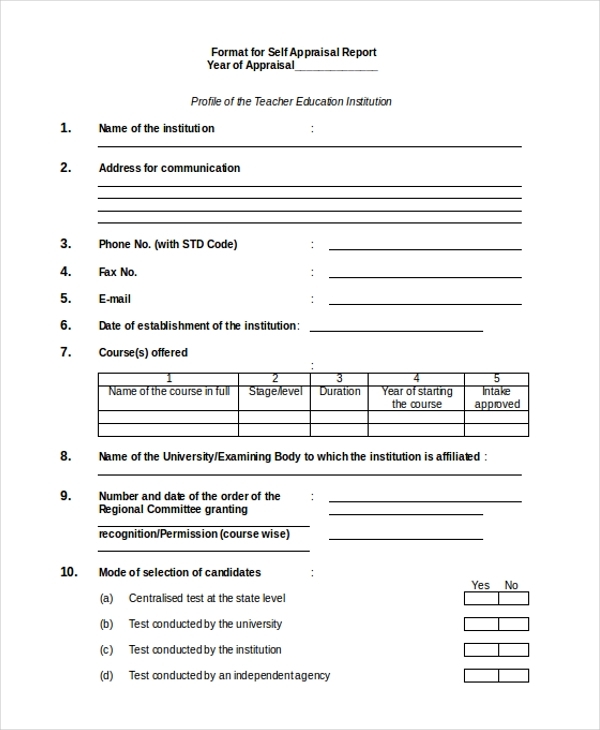 This self-evaluation form has been created especially for faculties and teachers at various institutions to let them assess their own performance over a particular year. This assessment will help in improving the teaching efforts for better results. Check out this hourly employee self-appraisal form and get downloaded online instantly. This is ideal for employees for assessing self-performance and rate self-efforts. It will help supervisors to measure your performance throughout the year. Why are Self-Appraisal Forms Important? Self-evaluation is one of the important things in an organization. 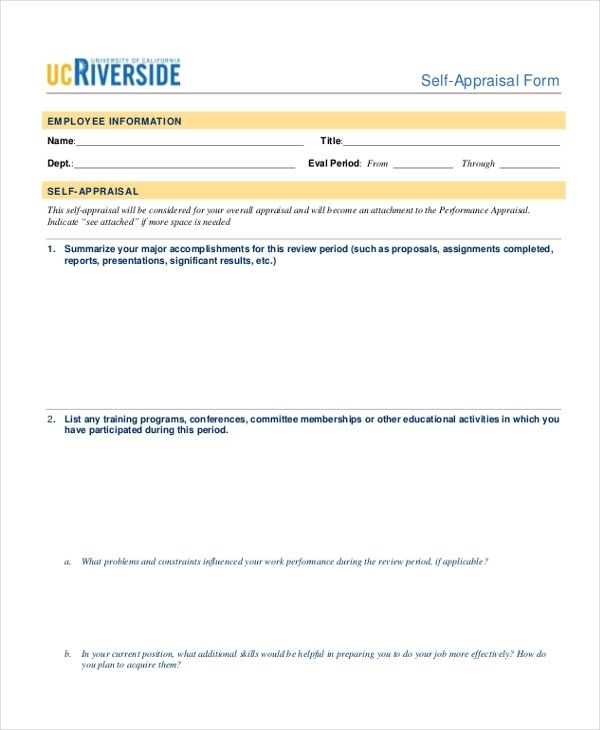 Whether you are deciding on appraisals or need to take corrective actions, a self-assessment form is provided to the employees to rate themselves on the basis of their performance. Using a self-assessment form an employee is supposed to critically analyze his/her own performance and identify strengths, weaknesses, expectations from the organization and all. Usually, organizations conduct self-assessment processes during the appraisal period. A self-appraisal form can help organizations identify accomplishments of the employees and their stands for the sake of organization. you can also see Real Estate Appraisal Forms. What are The Benefits if a Self-Appraisal Form? Among countless benefits of self-appraisal forms below are a few of the major ones that make these forms necessary for every organization. These forms help organizations to make employees self-assess their performance on the basis of various standards. These forms can help employers identify the strengths and weaknesses of every employee and thus take corrective actions to further enhance the performance for more productivity. Self-assessment by employees also help businesses to identify the expectations of employees from the organization in regard to appraisals. These are highly helpful in deciding appraisals or salary hikes to be offered to the employees. Do you want to effectively manage the upcoming appraisal period? Get the above suggested Self Evaluation Forms downloaded online and let your employees evaluate their own performance by themselves critically. These are usually available in Word and PDF formats hence you can make changes to these formats and make them suitable as per your company’s evaluation preferences.